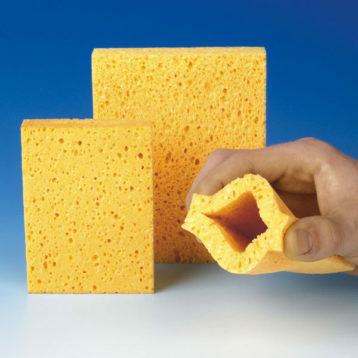 For some applications it is important that the sponge has one or more drill holes. The drilling holes are used as holding devices within specific equipment (e.g. medical electronic systems). They are also perfect for other processes giving free passage to liquids which have to be applied to different surfaces (e.g. polishing or oiling surfaces). 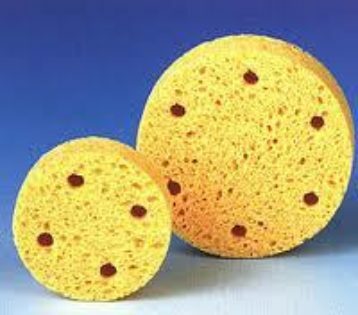 Depending on the application and the design of the sponge, we choose the most suitable type of processing. Drilling holes can be manufactured manually or automatically by different machines. The profile of the drill holes can depend on the design, size and the porosity of the sponge. During the construction process of your project we will find the best solution. We also offer the possibility of slotting the sponge. To do this small horizontal saws are used which allow the production of pouches or bags in the sponge. These can be used in a wide range of products including electrotherapy systems.